Advent is considered the start of the Roman Rite’s liturgical year as a matter of logic and convention, but is not formally designated as such in the liturgy itself. In the Byzantine Rite, on the other hand, the liturgical year has a formally designated beginning on September 1st, a custom which has its origin in an ancient Roman cycle of taxation known as the Indiction. This was celebrated as the civil New Year in the Byzantine Empire until the fall of Constantinople in 1453, and in Russia until in 1699, when it was changed by Peter the Great as part of his Westernizing reforms. The Indiction is still mentioned repeatedly in the liturgical texts of September 1, as in this Idiomel for Matins. The Byzantine tradition distinguishes twelve feasts, eight of Our Lord and four of Our Lady, as “Great Feasts”, with Easter in a category of its own as the Feast of Feasts. Whether by design or coincidence, the first of these in the liturgical year is also the first chronologically, the Nativity of the Virgin on September 8th. This event does not of course occur in the Bible, but is first mentioned in the popular apocryphal work known as the Protoevangelium of James. The precise origin of the feast is a matter of speculation, and the reason for the choice of date is unknown. It was celebrated at Constantinople by the 530s, when St Romanus the Melodist composed a hymn for it; by the seventh century, it had passed to the West, and Pope St Sergius I (687-701) decreed that it be should celebrated with a procession from the church of St Adrian (who shares his feast day with the Birth of the Virgin) to St Mary Major. It would seem, however, that it was rather slower to be accepted than the other early Marian feasts, the Purification, Annunciation and Assumption, since it is not mentioned in some important early liturgical books. Thus we find it included in the oldest manuscript of the Gelasian Sacramentary in roughly 750 A.D., but missing from the calendar in some later books. 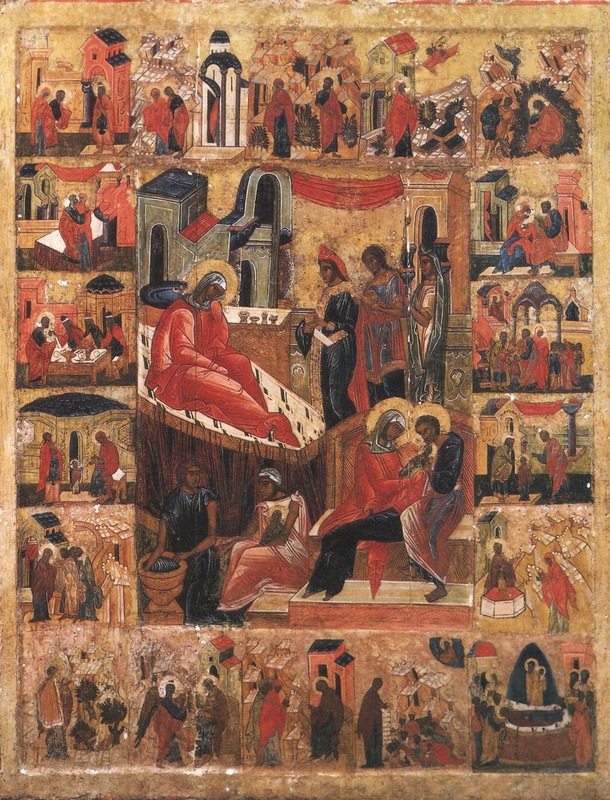 A 16th-century Russian icon of the Birth of the Virgin. From the Byzantine Rite, the Roman borrowed the following troparion as the antiphon at the Magnificat for Second Vespers, surely one of the most beautiful of the entire Gregorian reportoire. Ἡ γέννησίς σου Θεοτόκε, χαρὰν ἐμήνυσε πάσῃ τῇ οἰκουμένῃ· ἐκ σοῦ γὰρ ἀνέτειλεν ὁ Ἥλιος τῆς δικαιοσύνης, Χριστὸς ὁ Θεὸς ἡμῶν· καὶ λύσας τὴν κατάραν, ἔδωκε τὴν εὐλογίαν· καὶ καταργήσας τὸν θάνατον, ἐδωρήσατο ἡμῖν ζωὴν τὴν αἰώνιον. Nativitas tua, Dei Genitrix Virgo, gaudium annuntiavit universo mundo: ex te enim ortus est sol justitiae, Christus Deus noster: qui solvens maledictionem, dedit benedictionem, et confundens mortem, donavit nobis vitam sempiternam. Thy birth, O Virgin Mother of God, proclaimed joy to the whole world; for from Thee arose the sun of righteousness, Christ our God; who released us from the curse, and gave us blessing; and confounding death, He granted us eternal life. Ironically, it was another sermon of St Fulbert, preached not on the Nativity, but on the Annunciation, which became the standard medieval Office sermon for the feast, since it was included among the sermons of St Augustine. This inclusion was perhaps not an accident, but a way of adding greater authority to the work of a “new” author on a new custom. (It is still to this day noted as “A Sermon of St Augustine” in the Breviary of the Extraordinary Form.) This text would have a huge fortune in the history of Marian devotion, since a part of the peroration became one of the most commonly used texts for antiphons and responsories of the Virgin Mary. Sancta Maria, succurre miseris, juva pusillanimes, refove flebiles, ora pro populo, interveni pro clero, intercede pro devoto femineo sexu. Sentiant omnes tuum juvamen, quicumque celebrant tuam commemorationem. Holy Mary, come to the aid of the wretched, help the weak in spirit, refresh the mournful, pray for the people, intervene for the clergy, intercede for all devout women. May all those who celebrate the commemoration of Thee perceive Thy aid. The words occurring before and after these were often used in France as lessons for Matins in the Little Office of the Virgin Mary, as for example in the Cistercian Use, which, with characteristic austerity, proposes the same single lesson every day. Admitte, piissima Dei Genitrix, preces nostras intra sacrarium tuæ exauditionis, et reporta nobis antidotum reconciliationis. Sit per te excusabile quod per te ingerimus: fiat impetrabile quod fida mente poscimus. Accipe quod offerimus, redona quæ rogamus, excusa quod timemus. Most holy Mother of God, admit our prayers into the holy place where Thou may hear them, and bring us the remedy of reconciliation. Through Thee, may all be forgiven, that we place therein also through Thee; and what we ask with confidence become obtainable. Receive what we offer, grant in return what we ask, obtain pardon for what we fear. 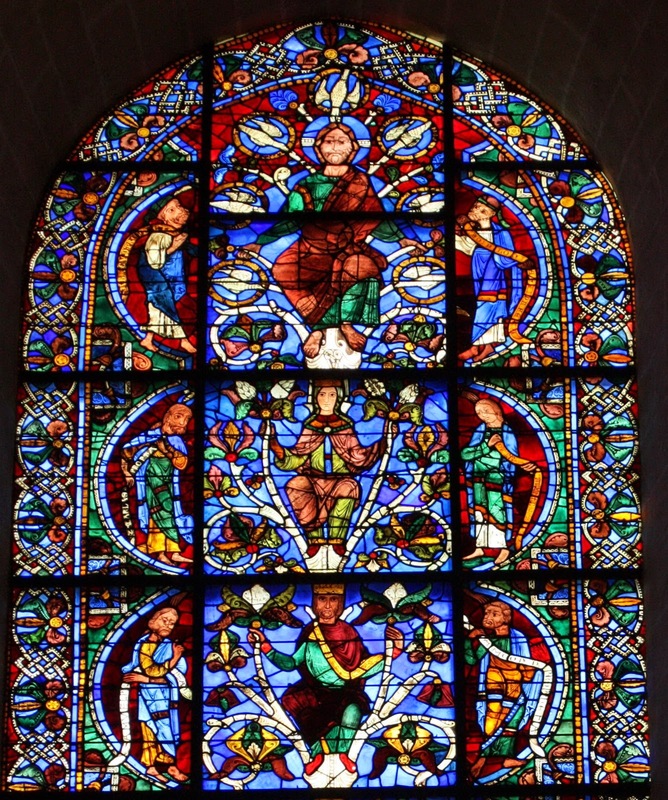 The upper part of the Tree of Jesse window, one of the most famous and best preserved of the stained glass windows in the cathedral of Chartres, from the end of the 12th century. At the Papal conclave of 1241, one of the most difficult in the Church’s history, the cardinals were forcibly enclosed in a ruined building known as the Septizodium, then a thousand years old, under such rough conditions that one of their number died. This was done by another cardinal, Matteo Orsini, in an attempt to force the election of a Pope favorable to certain interests which he backed. The cardinals vowed to honor the feast of the Virgin Mary’s Nativity by granting it an octave, if She would lead them to agreement on a candidate and obtain their deliverance; the liturgical commentator William Durandus, writing at the end of the century, notes that the Pope thus elected, Celestine IV, died after a reign of two-and-a-half weeks, and it was left to his successor, Innocent IV, to fulfill the vow. On both the vigil and feast, a lesson is read which very cleverly links two Biblical passages traditionally associated with the Virgin Mary, the sixth chapter of the Song of Songs, and the twenty-fourth of Ecclesiasticus. Thus sayeth Wisdom: Song 6, 8-9 She is the only one of her mother, the chosen of her that bore her. The daughters saw her, and declared her most blessed: the queens and concubines, and they praised her. Who is she that cometh forth as the morning rising, fair as the moon, bright as the sun, terrible as an army set in array? Eccli. 24, 24-28 I am the mother of fair love, and of fear, and of knowledge, and of holy hope. In me is all grace of the way and of the truth, in me is all hope of life and of virtue. Come over to me, all ye that desire me, and be filled with my fruits. For my spirit is sweet above honey, and my inheritance above honey and the honeycomb. My memory is unto everlasting generations. The Protoevanglium of James mentioned above is also the source for the names of the Virgin’s parents, Ss. Joachim and Anna. Because it is an apocryphal Gospel, their feasts were suppressed from the Roman Rite in the reform of St Pius V, along with the Virgin’s Presentation in the Temple, which is also first mentioned therein. This went far too strongly against the grain of traditional piety, and all three feasts were swiftly restored, St Anne’s by Pius’ own successor, Gregory XIII, in 1584, the Presentation by Sixtus V the following year, and St Joachim by Gregory XV in 1622. In the Roman Rite, his feast was assigned to the Sunday within the Octave of the Assumption, and later fixed by St Pius X to August 16th. 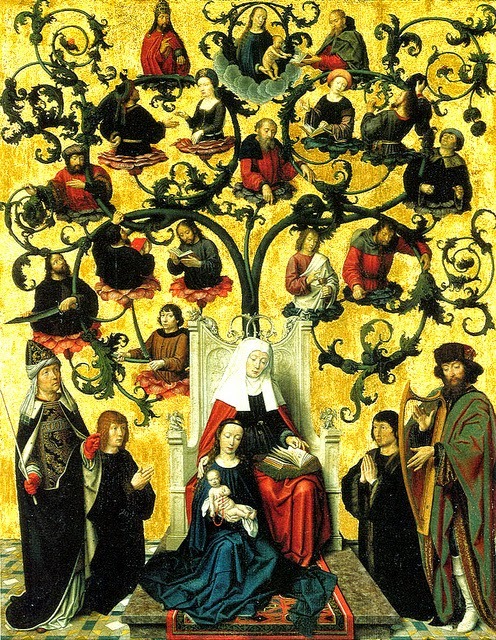 The Ambrosians, however, placed it on September 9th, the day after the Virgin’s Nativity; arguably a more reasonable choice, since the ancient tradition was that Joachim and Anne were both quite elderly at the time of the Virgin’s birth, making it certain that neither was still alive at the time of the Assumption. On both feasts, in both the Roman and Ambrosian liturgies, the Gospel is the genealogy of Christ from the beginning of St Matthew, chapter 1, 1-16. From ancient times, it was understood that this Gospel, in tracing the royal descent of St. Joseph, shows that the Virgin Mary is also descended from King David, to whom the promise of the Messiah was made. Since Joseph is commended as a just man, he would not transgress the law that a Jew must marry within his own tribe, and therefore Mary must also be of the tribe of David. A passage to this effect from St John Damascene’s book “On the Orthodox Faith” (book 4, 15) is read in the Roman Breviary on the feast of St Joachim. On September 12th, 1683, the combined armies of the Holy Roman Empire and the Kingdom of Poland defeated the invading armies of the Ottoman Empire at the gates of Vienna, a battle which would prove to be the high-water mark of the Turkish invasion of Europe. 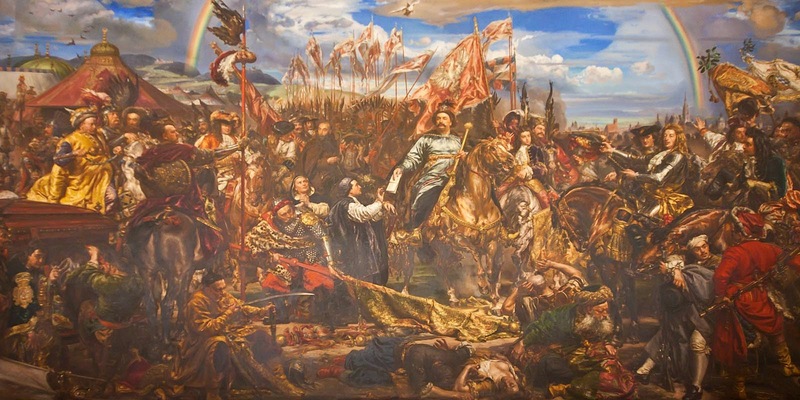 The King of Poland and commander of the Christian armies, Jan III Sobieski, had placed his troops under the special protection of the Virgin Mary, as they rode to the defence of Christendom. In thanksgiving for the victory, therefore, Blessed Innocent XI (1676-89) extended to the universal calendar the feast of the Holy Name of Mary, thitherto kept only in Spain and Naples. It was originally assigned to the Sunday within the Octave of the Nativity of the Virgin, but later fixed by St Pius X to September 12th. (The reform of 1911 abolished the once-common custom of fixing feasts to particular Sundays, with a few exceptions.) In the Calendar of 1969, the feasts of the Holy Name of Jesus and of Mary were both abolished, one of the reformers’ worst decisions, happily undone by St John Paul II in 2002. In the interim, it continued to be observed as the titular feast of many churches of the Virgin Mary, especially in Italy. King Jan Sobieski Victorious at the Gates of Vienna, by Jan Matejko, 1883. In the middle, King Jan hands to a Dominican friar a message to deliver to the Pope, announcing the victory; on the right, Leopold I, Archduke of Austria and Holy Roman Emperor, doffs his hat to him. The artist, himself a Pole, painted this in commemoration of the 200th anniversary of the battle, by which time the Kingdom of Poland had been partitioned between Austria, Russia and Prussia, and no longer existed as an independent state; he is here reminding the Austrians that their position as a dominant power in Central Europe was due in no small measure to the military might of the Poles, now in part their subjects. This painting was donated to the Vatican Museums by the artist, on condition that it always be prominently displayed; on the frame (not seen here) are medallion portraits of Bl. Innocent XI and the then-reigning Pope, Leo XIII. A copy of this image in silver relief was placed over the grave of King Jan in the cathedral of Krakow.